A procession of five goals to nil in a blistering second quarter from Ajax proved to be the deciding factor in Sunday’s Premier B Thirds semi final at Gary Smorgon Oval. Ajax won the game 17.13.115 to 11.5.71. After a competitive first quarter which saw only a goal the difference at quarter time, Ajax got a run on and Fitzroy found it hard to stop their momentum. 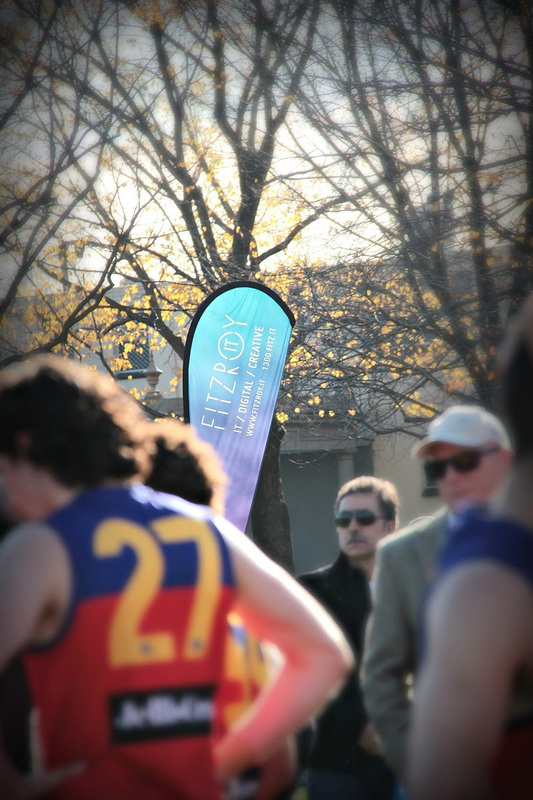 The third quarter was an excellent one for Fitzroy with some outstanding team play, accurate kicking and great goals, but the damage had been done and whilst they were scoring well, they couldn’t stop Ajax adding to their tally also. 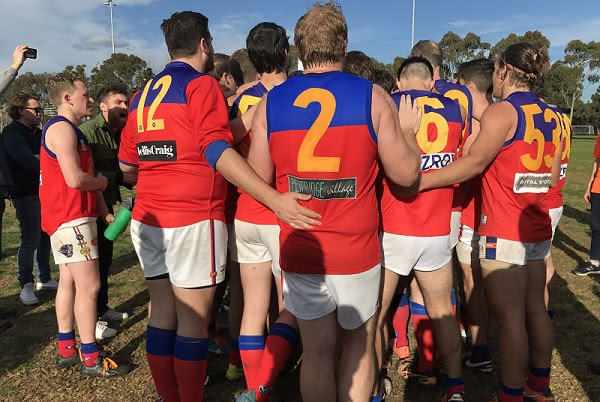 In front of a good crowd in excellent conditions, after Fitzroy had a sniff, the Ajax side just put on the after burners in the final quarter and pulled away for a decisive win. Simon Heather, who was named in the best players, continued to present up forward, despite often being double teamed, and scored two goals. Tim Denatris, Jared Shaw and Joe Atkinson also kicked two each. Atkinson, James Pitts, Simon Gunn, Nathan Grimshaw and Jamie MacKay joined Heather as the best players on the day. Ryan White and Sam Brygel scored nine goals between them for Ajax. Congratulations to coach Trent Coleman, captain Jared Shaw and all the Thirds players for making the finals in a very competitive season played with great spirit and passion, not to mention some incredible banners and badges along the way. And a special thanks to Claire Forbes who has provided a lot of the Thirds photos this year. FitzroyIT game the final at BSO this year – and it all comes down to this! 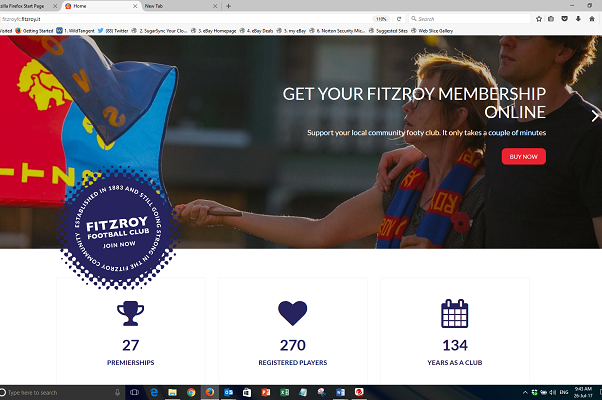 After a forgettable day against Old Scotch last Saturday, Fitzroy has left themselves with a very big challenge to stay in Premier B beyond this season. 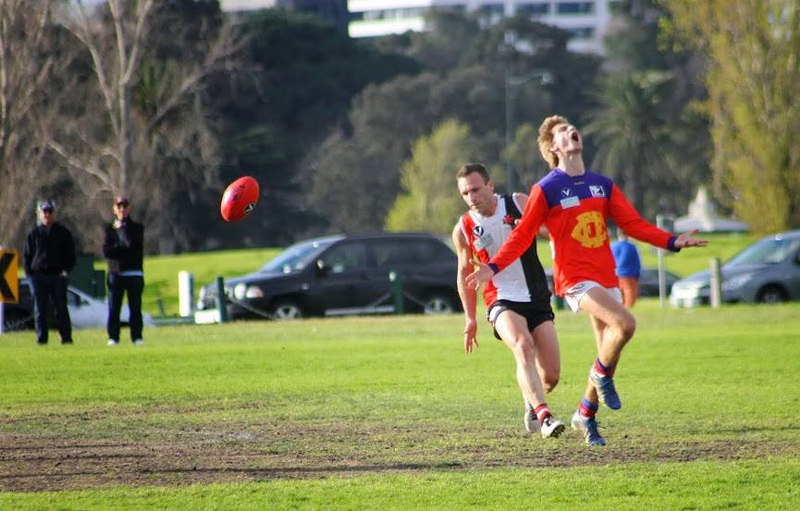 And it all starts on Saturday with the clash against Parkdale Vultures in the FitzroyIT game. The teams are vying to stay out of the relegation zone and they’ll also be battling for the Norm Johnstone Trophy as they do each time they meet. Fitzroy holds the trophy after a thrilling first round win over Parkdale at Parkdale in the opening, storm-affected game. Expect neither team to hold back as they compete for pride and to stay up, with two rounds remaining. There was a bright spark in last week’s game and it was first gamer Noah Wright, who did some eye-catching things including intercepting the ball in the middle of the ground and dashing forward to kick a dribbled goal. It broke a long drought for Fitzroy and got his team mates up and about. He tackled fiercely and was named as Fitzroy’s best. Julian Turner continued to show why he’s a great addition to the leadership team this year with another determined performance and he had plenty of company in Sam Baker, Max Ellis and Nathan Ligris. Old Scotch sit comfortably second on the ladder having lost only two games all year. They showed their skill and on-field organisation to double Fitzroy’s score 17.17.119 to 9.6.60 and but for wayward kicking it could have been worse. 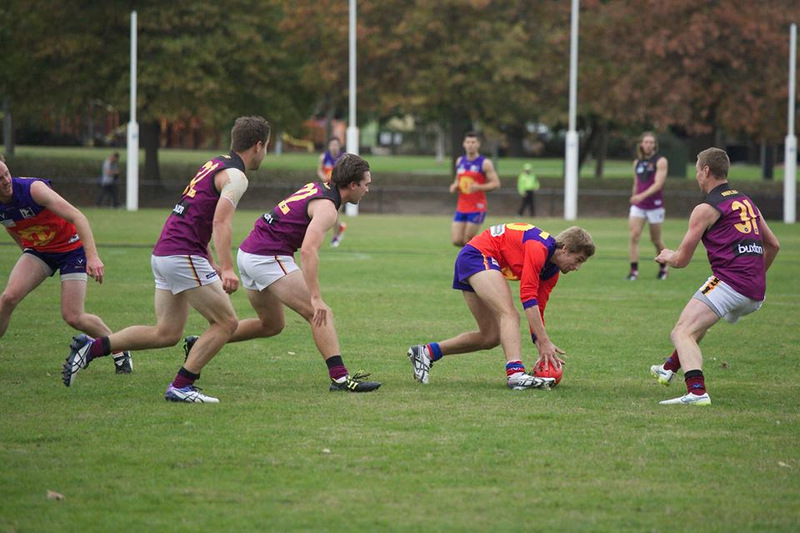 It should be noted that the Fitzroy side remains unsettled and unable to get a consistent team on the park. Amongst others absent from the recent line up, Captain Rory Angiolella was out of the game with flu. Hopefully it’ll be all hands on deck for this Saturday’s crucial game. We’re expecting a big crowd at Brunswick Street on Saturday and we’d love you to be part of it to cheer the boys on. You know you want one last burger or kransky before the season is done! Off field, the final home game lunch of the year will see us acknowledge the greatest contributors to the club over the last 25 years. You’ll hear from each of Graham Burgen (coach), Stephen Drury (premiership captain and player), Lloyd Browne (umpire) and Bill Atherton (volunteer). It will be a big day one way or another and certainly a fabulous opportunity to say thank you to the people who’ve made a big contribution to our club and the Reds who came before it. If you haven’t booked for lunch, you’ll need to do it TODAY. Bookings can be made here. What could possibly be a better reason for getting down to the Brunswick Street Oval this Saturday than it’s our last home game and last chance to cement our place in Premier B? Well, maybe it’s because it’ll also be your last opportunity to grab a famous (or some would say infamous) Kerry Burger for 2017. 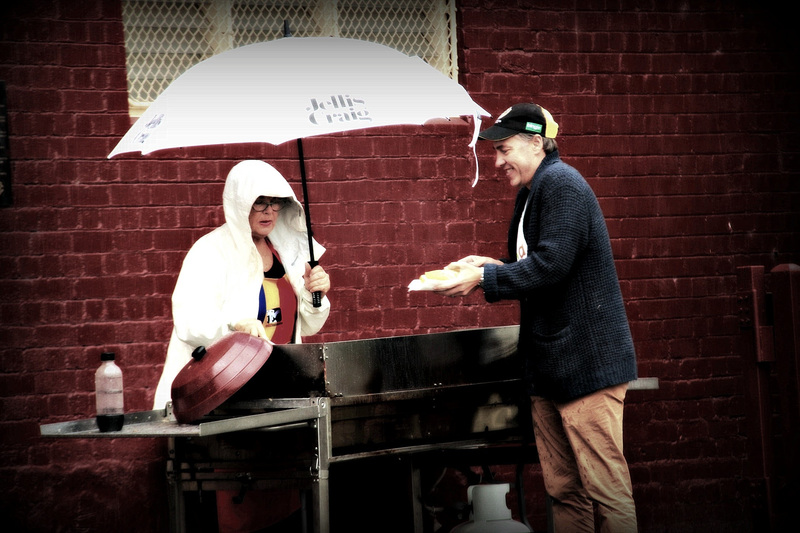 According to urban legend, a woman who lives across the road from the Brunswick Street Oval leaves her door open at the beginning of March every year to catch the first wafts of the barbeque. This is her sign that the football season’s started and she and her four kids can make the trek across the ground to grab lunch on the Saturdays the Roys are playing at home. Well why wouldn’t you? 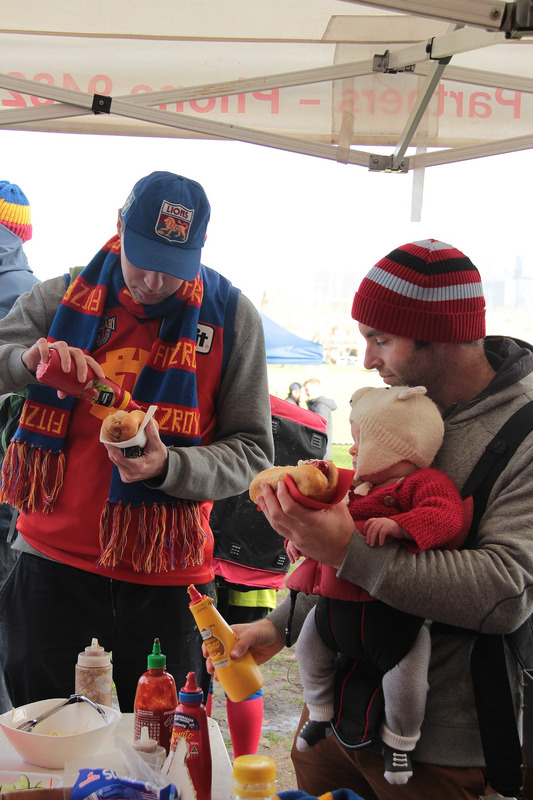 Fitzroy may not have the raw wealth of our opposition teams, but in many ways we have so much more. Stuff that money can’t buy. A proud VFL/AFL history, a ground steeped in tradition, a passionate supporter base, and home-ground crowds other sides can’t even hope to match. And we have Kerry Burgers. It all started when son Rory was still in the Fitzroy Juniors and Kerry ran the canteen at the BSO and Ramsden Street, and then for a short time at the Fitzroy Bowling Club when the FFC and the Reds incorporated. With Rory’s rise to the seniors, Kerry started cooking burgers for the boys after the game. So what started as 20 burgers after home games has grown to about 120 and doesn’t include the meals Kerry and her helpers dish up on Thursday training nights. This amounts to about 12 years all up – with a couple off for hip replacements. “I’m extremely lucky,” says Kerry. “Being part of the Fitzroy community, I’ve been able to watch generations grow from raw young recruits to become seasoned players and responsible family men. “I’ve been able to enjoy many a happy time over the years with the boys and their families, at Club nights, in the rooms, and at the Derby after games, making dear friends along the way. The downside? It’s not what you’d call a glamourous role. By the time the final siren rings on home games, Kerry exudes the once-enticing aroma of the barbeque. But home or away, full of grease or freshly washed and coiffed, we all love Kerry and attribute to her the beauty she attributes to home-game crowd. Master burger chef, Kerry Winchester, flanked by fabulous canteen staff Theodora (left) and Mietta (known, she says, only as ‘Rory’s sister’). In celebration of his fabulous 100th game career, RedRoy nabs classic footballer Nick Marshall for a classic Q&A. I came to Melbourne to study at Victoria University and wanted to find a club in the city. I’d played all my junior football in country Victoria for Terang-Mortlake FC in the Hampden Football League (south west Victoria). 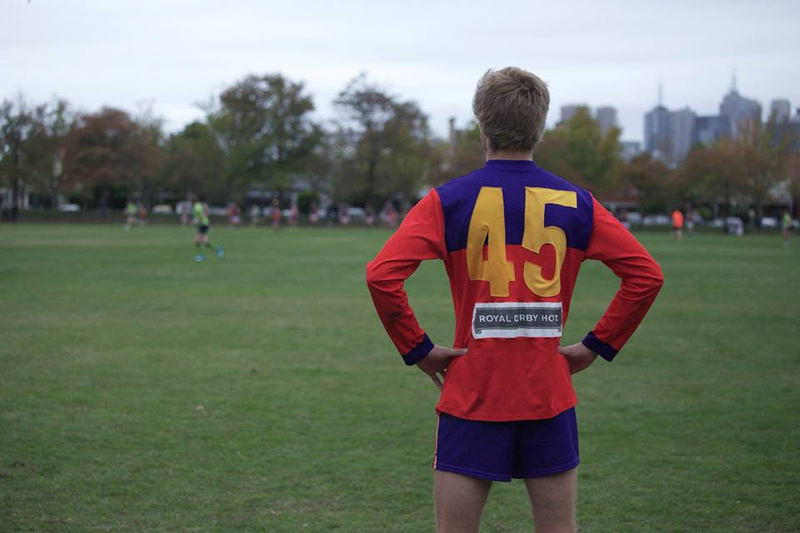 I’d barracked for Fitzroy when I was little, and still follow Brisbane today, and when I noticed that Fitzroy still existed in the VAFA, I thought it would be neat to, in a way, play out that ‘boyhood dream’ of playing for the team you barracked for while growing up. The other reason I chose Fitzroy was that in 2011 the U19 side had just been elevated to the Premier division of the VAFA competition and I thought it would be a good challenging standard of footy to try and play in. Without doubt the best thing about playing for Fitzroy is running out on the historic Brunswick Street Oval in front of original Fitzroy supporters. The club has a genuine community atmosphere similar to a country football club which I thought I would lose when I came to the city. But the crowds we get 'rain, hail or shine' never cease to amaze. Special mention should go to Steve and Louise Maniatakis who always look after me with a bag of snakes after each game. My fondest memory is certainly the 2012 Reserves premiership. I've only played in two premierships in my footy career, the last one being back in the U14s at Terang-Mortlake. So that Reserves premiership will always be a highlight which I get to share with the boys who played, as well as a lot of my family and friends who made the trip up to watch that day. I've played a lot of my football at Fitzroy out on the wings, where I can get a bit of space so I'm always really appreciative and impressed by the work the in-and-under-hard-nut midfielders like Olmo Salvatore and Al 'Red Dog' Mulligan do to extract the footy from stoppages and feed it out to runners. In a similar vein I love the way Jono Anderson goes about his footy in the backline, he rarely loses a one-on-one contest which makes him super reliable teammate. I'm really fortunate in that I’ve been sponsored the last few years. Bill Atherton sponsored me for the last couple of years and Michael Manoli has backed me this year. As a University student, things like football registration can stretch the budget a bit at times so I’m extremely thankful for the generous support of people like Bill and Michael who’ve been able to help me out. One of my less fond memories happened a few years ago playing against AJAX at Gary Smorgon Oval. I went to take a bounce while running through the middle of the ground. However, I bounced the ball straight down on the cricket pitch and the ball went flying over my head. I can laugh about it now but my reaction at the time speaks for itself. Thanks to Phyllis for the photo! The Community Rooms is the place to be for some fun and frivolity and there are some big prizes on offer. A $50 entry fee will include finger food and five drinks from 7–11pm on Saturday 26 August. It will also buy you entry into the games. The players will have some surprises for you. Ideally you come in pairs. This has become something of an end-of-season tradition, so please join us. It’s been a very tough year for our Under 19s teams and this weekend sees them wrap up their season. 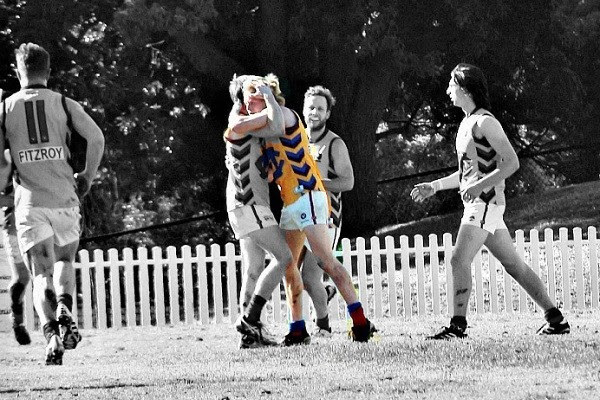 The Under 19(2) side will be at home at Ramsden Street taking on Oakleigh at 1pm, whilst Under 19(1) team will meet Uni Blacks at Crawford Oval. Last week Under 19 (1) went down to Williamstown CYMS 4.9.33 to 12.16.88. Eddie Lincoln kicked two goals, whilst Vincent Barker and James Butler were among the best players. It’s good to see Jimmy back out there and having an impact after a nasty broken wrist in the Seniors in round 1. De La Salle made life very difficult for the Under 19 (2) team, defeating them 13.18.96 to 1.4.10. Elijah Messenger was the goal kicker as the team blooded several Colts players over the last few weeks, with more pulling on the boots this week. Thank you to all the Under 19 players, coaches, parents and volunteers for helping us work through the first season in a while with two Under 19 teams on the park. As it is the FitzroyIT game on Saturday, named for our major sponsors, the FitzroyIT team will be out in force at the lunch and the game. If you want to speak to the designers and developers of our beautiful new website, then this might be the time for a quick introduction. Look out for Tim, Justin and the team. Romance is alive and well at Fitzroy. A former Roy Girl and Roy Boy recently wed in Germany. 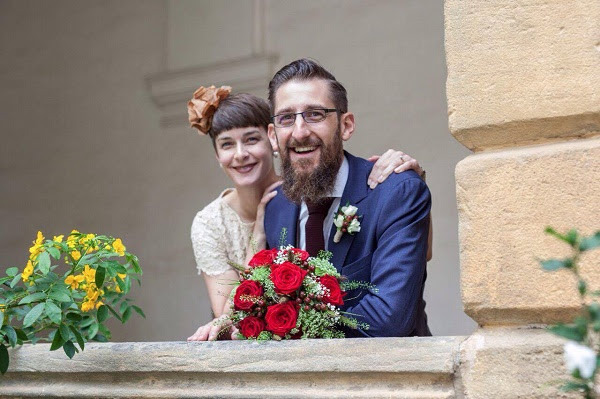 One of the inaugural Fitzroy-ACU Women’s players Bianca Maes has married former Thirds player Seb Loch in regional Germany. Bianca, who kicked the very first goal for Fitzroy-ACU and also played in last year’s VWFL grand final, played in round 1 this year before heading off to Europe. Soon after she arrived in Germany, Bianca was selected to represent the Australia Spirit team against France in the 9th annual Anzac Cup in Villers-Bretonneux on Anzac Day. Seb, who hails from Germany, was a Thirds player from 2014 and played 11 games, suffering an injury at the start of the 2016 season so only played one game for the year. News and photo of the beautiful day come to us courtesy of recently-retired Roy Girl, Amelia Zehnwirth, who was also married recently. Amelia said that in true Fitzroy style, Bianca played her Summer sport of cricket the day after the wedding. Her German team went on to win the Women's European cricket tournament. What a star. Here’s to a long and happy life. Prost! Please note change of venue for next week's Reserves and Seniors games: the games will now be played at Princes Park Caulfield, Bambra Road, Caulfield (also known to Roys supporters as Old Haileybury's home ground).